Bovada Casino is an online casino derived from Bodog Casino, one of the largest brands in the Internet gaming world. Bovada Casino holds a license from the jurisdiction of Kahnawake and accepts US players. 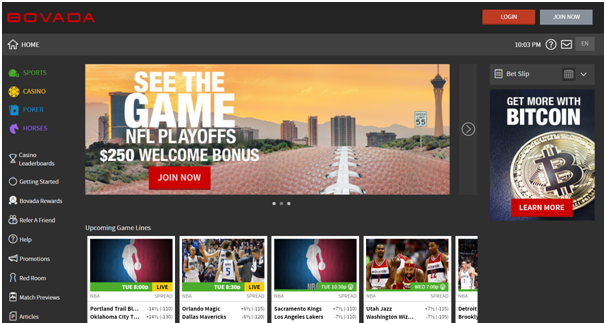 Launched in 2011, Bovada has been offering online betting experiences like no other. There are lot of things to do at Bovada. Not only you can play Las Vegas style casino but also place bets in their sportsbook and racebook which includes everything from major sports leagues, to obscure events happening in other parts of the world. If horse racing is more your thing, they have 94 tracks to bet on. Also there are various poker tournaments going on a Bovada casino. All this and much more you can enjoy with awesome bonus offers that the casino offers to its players. 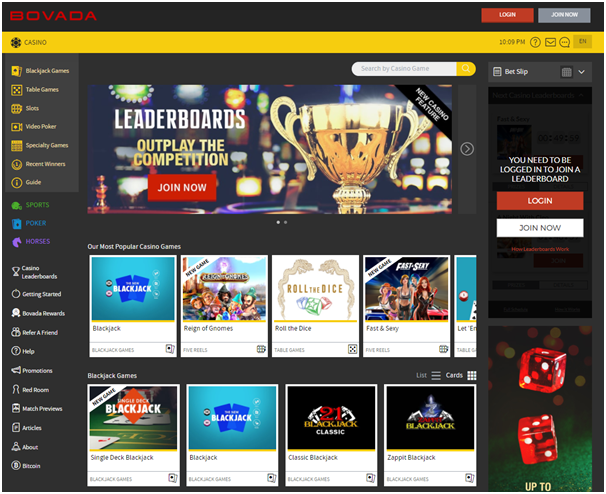 Bovada Casino features proprietary games that are also featured on their sister casino, Bodog. Powered by Real Time Gaming software, most of the games are completely original. In total there are 300 slots, with the most popular games including Reel Blood, Witches & Wizard, and Cleopatra’s Gold. However, those looking for a classic-style game are limited to a much smaller variety. There are plenty of table games at Bovada Casino. 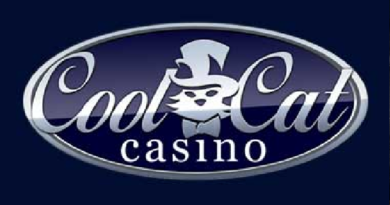 They currently offer 4 different blackjack games, 2 variants of roulette, as well as craps, Caribbean Stud Poker, Let ‘Em Ride, baccarat, Three Card Rummy, and others. Each game uses top-notch graphics and can be played with virtually any size of bet. For video poker players they offer a total of 17 different video poker variants. Whether you’re interested in traditional variations like Jacks or Better and Joker Poker or are looking for more extreme games such as Bonus Deuces Wild, Bovada Casino will likely have what you want. Unfortunately their multi-hand video poker selection is limited. Getting started need a good WiFi or internet connection, either play with PC or cell phone as the games are easily accessed with any browser be it chrome or safari or firefox. Simply type the casino url on your browser https://www.bovada.lv/ and enter the casino homepage. From there click on Join now as a new player and use a user name and password to login. Once done with the formality you can make a initial deposit and get to the choice of game category you want to enjoy. 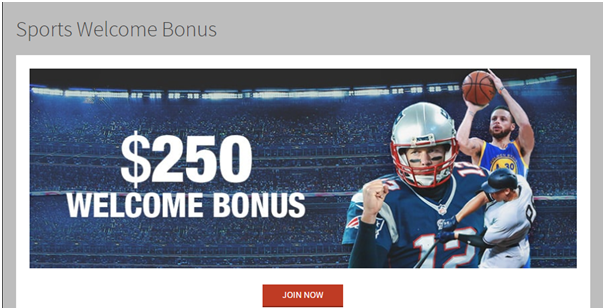 Get 50% Welcome Bonus on sports betting, simply redeem it, make a deposit and instantly receive a 50% bonus up to $250. Once your deposit is processed, your bonus will be available for wagering within 30 minutes. This bonus can only be redeemed on your first deposit. Rollover is 5X Sports/5X Horses/30X Casino on both the initial deposit and the bonus amount. Rollover in our Sportsbook, for winning wagers, will be determined by the lesser of your risk or win amount at the time of wager settlement; for losing wagers your risk amount will be credited to your rollover contribution. If a withdrawal is made before the bonus terms are met, all bonus funds as well as any money earned by wagering the bonus will be forfeited. For poker you are offered $500 as welcome bonus. 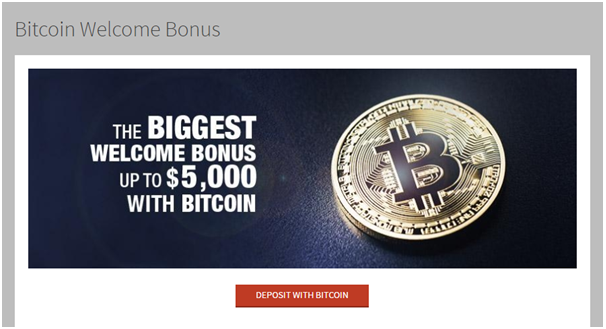 If you make a deposit with Bitcoin you get lucrative BTC bonus as well. 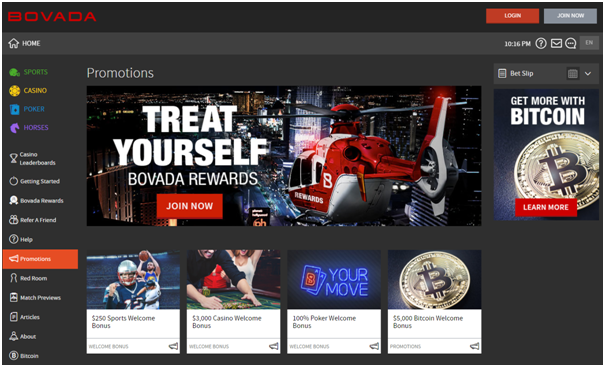 As a Bovada player you can score a 150% Bitcoin Casino Match Bonus up to $1,500 – redeemable three times – and a 50% Bitcoin Match bonus up to $500 to bet on sports. Use coupon code BVSBITCOIN50 for sports and BVCBITCOIN150 for Casino BTC bonus. But the bonuses don’t end there; you continue to receive credits for all your play that can be converted into more casino chips, plus you can designate one day a week as your “match” day to receive a deposit matching bonus. There are various banking options available at casino to make a deposit and withdraw at the online casino. You can fund your Bovada account with Bitcoin or a Credit Card be it Visa, MasterCard, American Express and select Visa Gift Cards. Select the deposit method you want to use from the drop down menu. Enter the amount you wish to deposit along with the required information based on the selected deposit method, and then click “Deposit”. Withdrawals are available by Bitcoin and Check by Courier. After logging in to your account, click on your balance amount at the top right-hand corner of the page and select “Withdraw.” You can also go to your Dashboard and click on Request Withdrawal at the bottom of the page. Select the withdrawal method available to you and enter the amount you wish to request. Click the checkbox at the bottom of the page to confirm that your account information is correct. You may then click on “Request Payout”. Your pending withdrawal is then marked as Requested. Withdrawals are processed each day on a first come, first served basis and can take up to 48 hours to get approved – as long as all pre-authorized or pending deposits to your Bovada account have been settled. You may be required to submit documentation prior to a payment being processed for verification purposes. Players with any type of issue may contact the support department 24/7 through the online live chat feature. With just a single click, you can get in touch with a representative in a matter of seconds. Bovada Casino also accepts inquiries through an online contact form, where players will get a response via email within a few hours in most cases. If you’d prefer to speak over the phone, Bovada may also be reached via a toll-free US telephone number 1-866-205-3353.